Algeria's coastline on the Mediterranean is more than 1200 km long. In combination with the country's strategic location for the development of Africa, that means that ports are vital for Algeria. To pass on the latest developments in port management and coastal hydraulic engineering, Deltares teamed up with STC-Nestra, a consultancy organisation for sustainable transport and logistics, to organise courses for experts from the Laboratoire d'Etudes Maritimes (LEM), a part of the Algerian Ministry of Transport. On the basis of questions from Algeria, Deltares consultants talked to Algerian port experts to share our knowledge and to provide training for a range of software and management tools. The knowledge and tools can make a qualitative contribution to the Algerian plans to extend existing ports and to develop the new port near Cherchell. The new port aims to be the hub for the flow of goods to the African continent. Deltares also shared its experience and expertise relating to the use of scale models in physical facilities in combination with computer models such as Delft3D. The LEM experts will use the time to come to implement Delft3D and acquire more experience with performing calculations and interpreting the results. Using tools of this kind helps to produce a sound assessment of the risks and opportunities for the locality that are involved in the construction or extension of infrastructure and to respond pro-actively. The training concluded with the ‘Port of the Future’. 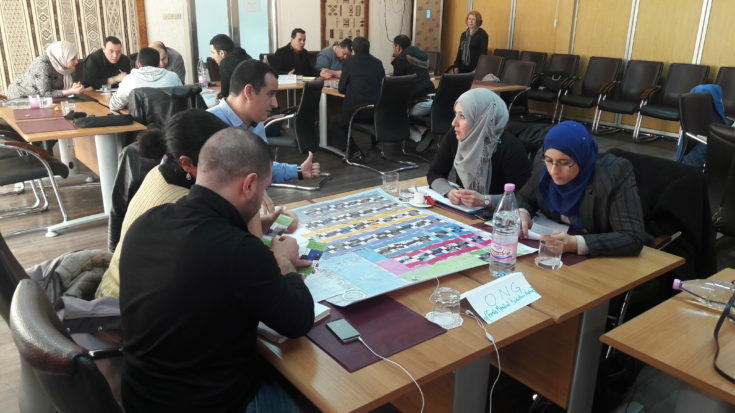 During this serious game, the participants covered many of the areas covered in the training, such as topics linked to port development and the associated stakeholder-related challenges. The game simulates a fictitious port area with realistic scenarios for port development. Participants were assigned different roles and then challenged to take action and develop their port in a sustainable way. They were then shown what effects their decisions had on society, nature and the economy. In this way, they gained a greater understanding of the decision-making process, the parties involved and how to produce a joint plan for a sustainable port. During the project, there was an investigation of potential opportunities for Dutch business in the large numbers of planned coastal and port developments in Algeria, in which LEM often plays a central advisory role. In addition, there is an ongoing exploration of how the collaboration between the research organisations could be continued in the future. All the work was conducted as part of an assignment from the Netherlands Enterprise Agency (RVO) with financing from the Dutch Ministry of Foreign Affairs.